A retro Black defiled Death Metal band from Grand Island, central Florida created during the winter of 1992 by erstwhile ACHERON guitarist Pete Slate, former INCUBUS bassist Mark Lavenia, vocalist Darkness (Matt W.) and drummer Stephen Spillers. 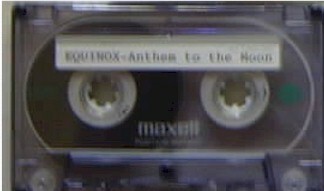 EQUINOX debuted with the demo cassette ‘Anthem To The Moon’ during 1993. 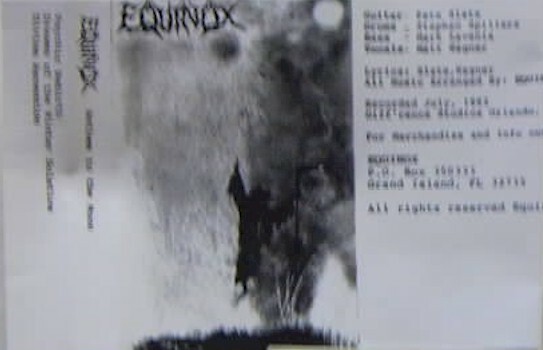 Second demo, the three track 'Equinox', was recorded at Morrisound Studios on 6th November 1993, following which Lavenia decamped. Darkness took over the bass role as the band also inducted another ACHERON veteran guitarist Tony Blakk. With this line-up the band cut ‘Upon The Throne Of Eternity’ promo and was pressed on red vinyl 666 copies, for the German based Silencelike Death Records. During the autumn of 1995 the group secured a deal with the Greek Unisound concern for the debut full length album ‘Return To Mystery’, recorded at Shock Lizard Studios and engineered by Tom Morris. Xeroxed cover. 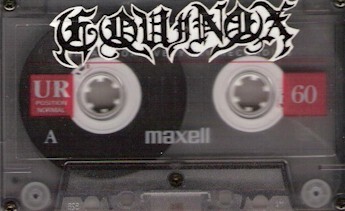 Recorded on regular cassettes. Original version below. Another version exists w/ pro covers..
Xeroxed cover. 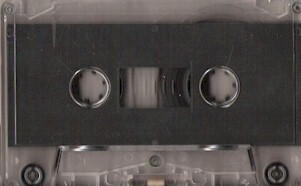 Recorded on regular cassettes. Professionally printed cover. Recorded on a studio tape. Originally "Upon The Throne..." was just put out as a two song demo but later released as a 7" EP.